Close to 2,000 blood donations are needed in the north of Scotland between now and Christmas to ensure the region’s vital stocks do not run out. Transfusion bosses are urging the public to find out their blood type and step forward to donate ahead of the festive break. Without regular donations, it is feared stockpiles could dry up in the coming weeks – plunging A&E departments in Aberdeen, Inverness, and across the country, into chaos. 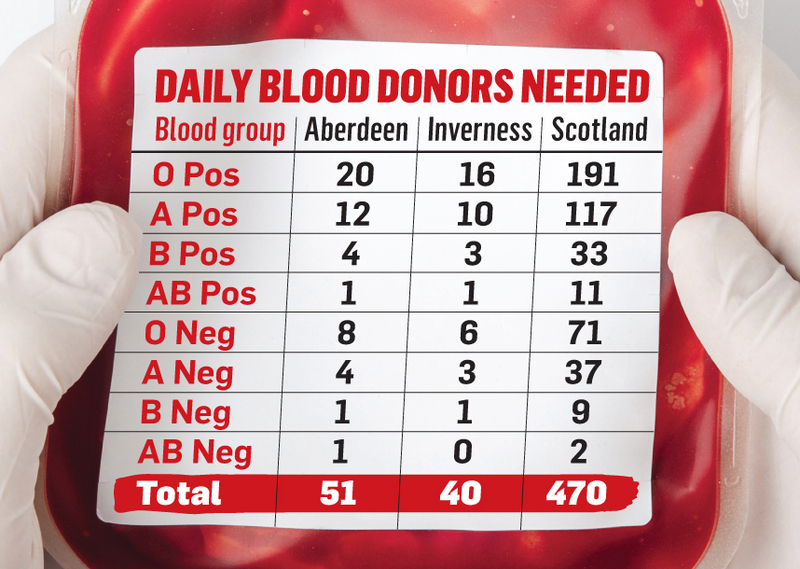 The Scottish National Blood Transfusion Service (SNBTS) needs to keep a five-to-seven-day supply of each blood type on hand at all times in order to meet clinical demand. To enable it to manage this it needs 51 donations from people in the north-east and 40 in the Highlands every day, alongside a further 380 in the rest of Scotland. Lynne Willdigg, the organisation’s associate director of donor services, said: “To keep supplies at safe levels overall in Scotland, we need 470 donors each day. “All blood groups are needed to support patients, some more than others depending on demand. “For example, O Positive is Scotland’s most common blood group, so we must welcome 191 people with this blood group every day. “O Negative on the other hand is the only blood group that can safely be given to anyone in an emergency situation. “Therefore it requires proportionately a higher level of donation to the population profile. She added: “As Christmas Day is a Tuesday this year – which is traditionally one of our strongest collection days – we are asking donors to come forward now to ensure stocks continue to build in the run-up to the public holiday. Anyone aged 17 or older, who is in general good health and weighs more than 7st 12lb (50kg) could be eligible to donate blood. To learn more or find your nearest donation session, visit scotblood.co.uk or call 0845 90 90 999. Without the “anonymous angels” who took the time to donate their blood, it is likely that Rod Mair would no longer be alive today. Five years ago, the 40-year-old from Hatton was no stranger to exercise and regarded himself as “fit and healthy”. But everything changed when he was struck down with severe stomach pains while at work one day in January 2013. “I felt so awful I had to go home and suddenly I started vomiting blood,” he said. 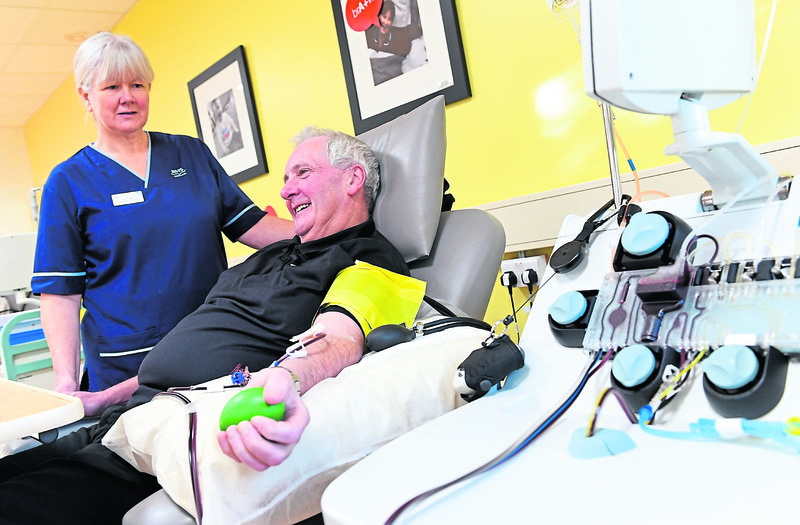 Apheresis Senior Charge Nurse Carol Fraser attends to Eric Harper while he donates at the Aberdeen Blood Donor Centre. It transpired that Mr Mair had an ulcer that had “burrowed” into one of his major arteries before bursting and filling his stomach with blood. “Without these anonymous angels, who took an hour out of their day to donate, I might not have survived,” he said. 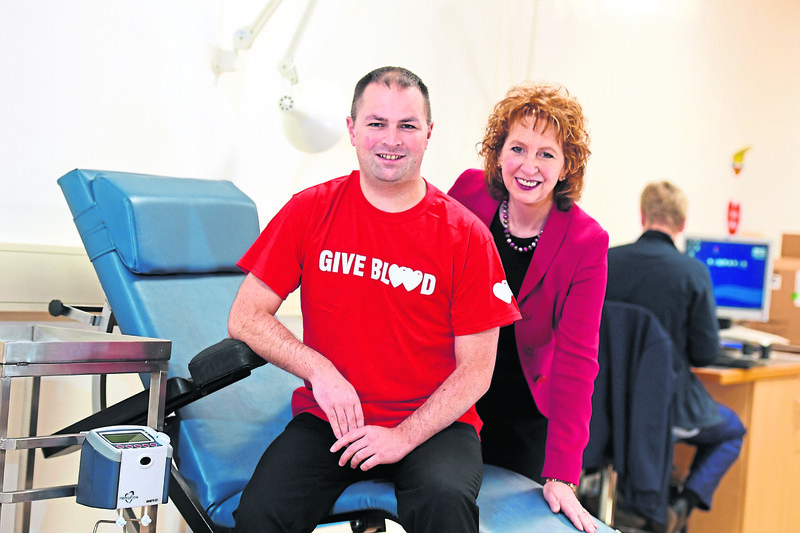 Mr Mair is backing the SNBTS’s call for people to give blood as regularly as they can – particularly this festive period – as they may also have to benefit from the service themselves one day. He said: “I am O Positive and used to give blood every few months – indeed I gave many donations.